The relationship between an individual’s genotype and its phenotype is a central issue in biology, but one that is largely unexplored for the important phenotype of complex social behavior. Here we examine the relationship between heterozygosity and social behavior among unrelated adult female rhesus macaques living on the island of Cayo Santiago (Puerto Rico). We show that female macaques with lower mean neutral heterozygosity were discriminated against by their unrelated conspecifics: less heterozygous females received aggressive behavior at higher rates and received affiliation at lower rates than more heterozygous females. We demonstrate that these results are likely due to local genomic effects associated with particular microsatellite loci. 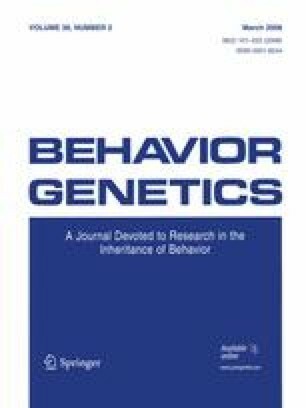 Our study suggests that genetic characteristics can impact the way an individual experiences its social environment and that female macaques that are homozygous at two microsatellite loci appear to be less attractive social partners based on grooming and aggression received by unrelated conspecifics. Marie J. E. Charpentier and Anja Widdig contributed equally to this work. The online version of this article (doi: 10.1007/s10519-008-9191-6) contains supplementary material, which is available to authorized users. We are grateful to the CPRC for permission to conduct this study. Furthermore, we are grateful to Fred Bercovitch, Matt Kessler, John Berard, Joerg Schmidtke, Peter Nürnberg and Michael Krawczak for their efforts to start continuous paternity analyses on Cayo Santiago as earlier as 1992. Andrea Trefilov, Heike Roessler and Ingrid Barth partly conducted the paternity analysis. We thank Linda Vigilant, Tim Coulson, Bill Amos and Courtney Fitzpatrick for their helpful comments on an earlier version of the manuscript. Finally, we are most grateful to Susan Alberts who gave us numerous advices and helpful comments during both the analyses and the writing of this manuscript. This publication was made possible by Grant Number CM-5-P40RR003640-13 award to the CPRC from the National Center for Research Resources (NCRR), a component of the National Institutes of Health (NIH). Its contents are solely the responsibility of the authors and do not necessarily represent the official views of NCRR or NIH. Further support was provided by the UPR Medical Sciences Campus, the German Science Foundation with an Emmy Noether grant to Anja Widdig (WI 1801/1-2) and Marie-Curie Outgoing and Intra-European Fellowships to both Marie Charpentier and Olivier Gimenez respectively.